Pre-event planning: International market research company GFK holds a Christmas party to reward staff. Having used the Oatlands Park Hotel in 2010, the company wanted to find a different venue to help build excitement. Sue O'Connell, facilities admin assistant, who organised the 1920s-themed event with colleague Shani Orchard, says: "We try to have a theme each year." Challenges: The venue needed to be local to GFK's office in Surrey, to minimise travel time and costs. The party was planned for a Friday night in early December - a peak date. O'Connell says: "We looked at the venue in early August, and sent out a 'save the date' request in the quarterly newsletter. Around six weeks before, we started dripfeeding details, and then revealed the venue two weeks before." Solution: Orchard was a member of the Brooklands Museum, so familiar with its event spaces. 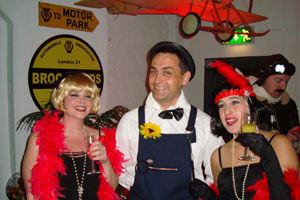 "It was a really good fit for the 1920s theme, and 80 per cent of staff came in fancy dress," O'Connell says. Delegates were taken to the venue on the museum's Routemaster bus, where they enjoyed bucks fizz surrounded by its vintage car collection, before dinner and entertainment in the Chequered Flag Room. A disco and bar were held in separate rooms. O'Connell was impressed with the venue's solution to an unexpected vegetarian request. "The chef had prepared additional vegetarian meals - it was very professional." Post-event analysis: Although the company tries to use a different venue each year, O'Connell said they would consider using the museum again. "We got very good feedback," she says.